Part of the show How many geckos to hold up a human? 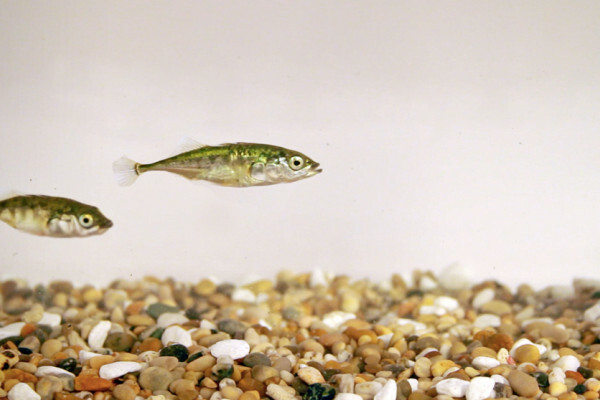 Jolle - I'll be talking about the three-spined stickleback, which is a small little fish that can be found throughout the UK and the northern hemisphere. Ginny - And you've actually brought some sticklebacks with you today. Is that right? Jolle - Yeah, exactly. Let me show you. Ginny - So, you've got here a see-through plastic box and in it are two tiny little fish. They're only about maybe an inch and a half long and they're sort of goldy colour. They've got big eyes and I can see their little fishy mouths going blob, blob, blob. They look like nice enough fish, but they don't look hugely amazing to me at the moment. Are you going to try and convince me differently? Jolle - Yes, definitely. What is quite cool about this fish is they have these really elaborate breeding displays. So, the male, they make this nest in the river, tries to get a female and becomes really red during their breeding season to impress a female. What they then do, they have this really cool zigzag dance, after which, the female hopefully for the male delivers the eggs. What is really cool as well is that these male sticklebacks are really good fathers. They not only defend the nests from predators and other sticklebacks, but they actually carry the young in their mouths when they go too far from the nest. What is also really cool is these fish actually have personalities. And thinking like, how can animals have personalities? Well, they have really consistent behaviours. So, you can imagine like some people take a lot of risks and others are really shy. Some are really social and some other fish might be quite solitary. But this is exactly what we find in the fish as well. What I'd like to show you today is some really cool aspect of this fish namely, although they look very ordinary, they can change colour. And not only that, they can change colour in this next hour. What I have behind me here is a couple of buckets, different environments that the fish might see in the world. Ginny - What can you see there? George - In the white bucket, I can see little white pebbles and in the black bucket, I don't really see anything except plain water. Ginny - So, in the bottom of the black bucket, it's quite hard to see but there's actually some black sand in there. Is that right? Jolle - Yeah, that's correct. When they're in the wild, they can sometimes live in these light streams where there's not a lot of cover and it's white sand. But other fish population may live in these really dark streams. And sometimes fish might actually encounter both. So, it might be helpful for them to actually be able to change colour. Ginny - So, I guess these are quite small fish. I can imagine they're prey for quite a lot of different things. Jolle - Yeah. Actually, 50 different predators have been described. Think about birds and fish, but actually, did you know that insects can actually predate on these small sticklebacks. So, there's many species that adapt to their environment and they look like their environment. So, this is something you can find throughout the animal kingdom. But there's actually not that many species that are able to adapt very quickly and they change colour. This is what I'd like to show you tonight. Ginny - So, we're going to actually see some sticklebacks change colour? Jolle - Hopefully, yes. In an hour, you'll see which fish will be in the white bucket and which fish will be in the black bucket. Ginny - Should we get it setup then? Jolle - Definitely, yes. Let's go. So, what we have here is just three buckets. There's a nice big bucket with greyish gravel and a nice plant for them for cover. There's 10 fish in there and what I will do, I will put 5 fish in the black bucket and 5 fish in the white bucket. Ginny - Okay, so we've got 10 of these fish that are all the same colour. They're this sort of light brownish, greyish, goldish colour - I think it's probably the best way of describing it. And we're going to hoik them out with a little net and put them in the different buckets. They are quite hard to see. They're very well camouflaged against that sort of greyish brown gravel you've got in the bottom of that bucket. Jolle - Exactly. They have been in this bucket with the brownish gravel for an hour now and it's hard for me to even find them. So hopefully now in an hour, we'll see that they actually change colour. Ginny - So, how do they actually change colour? What is it that's going on inside the fish? Jolle - Well, so for this very rapid colour change, what happens in the cells of the fish, they have these pigments in these cells called chromatophores and the pigments can be either dilated or contracted. If the pigment comes together, they might look much darker than when it's dilated. But when you put fish in different environments for longer periods of time, actually, these cells and the pigments starts to really go away. So, it's a totally different process when that happens on a short time scale versus a long time scale. Ginny - So, is it similar pigment that gives us say, brown hair versus blond hair - the same sort of idea? Jolle - Yeah, it's very similar indeed, yeah. Ginny - But they can actually control that. So, that will be like me being able to say, I quite fancy being blonde this evening. Jolle - Well, it's not really like that. Jolle - Yeah, it would be great, wouldn't it? The way it works actually is that it's based on the vision of the fish then sends a signal to the small brain of the fish and then autonomously the cells start to change the pigment. Ginny - So, it's an automatic reaction based on what's around them that makes them blend in. Ginny - And do all fish change as quickly as each other or does it differ between different fish? Jolle - This comes back to this personalities I talked about before. Namely, these bolder fish that take a lot more risk, they're not as responsive to their environment and it takes it much longer to change colour to blend in to their environment. Amazing, isn't it? Ginny - It really is. I'd never heard of fish that could change colour before. It's fascinating! Thank you so much. Now, we'll be coming back to Jolle later to see how his fish have got on. But first of all, let's go over to the judges. What did you think of that, Georgia? Georgia - Thank you, Jolle. Well, when you put those fish out, I thought they look so boring, like maybe I'd eat one. But after your talk, I think I'd actually quite like to be one. They have personality, they make good fathers, and I think I really like the idea of a man turning red to impress me. I might need to revise my score later if I see you running around with paint later, but for now, I'm very impressed. George - I think you explained it quite well, but I was wondering about, you said they try to impress mates, do they end up having to fight over mates? Jolle - Yes, they do. When the breeding season starts, the temperature of the water rises, the light increases and this elicits this red coloration in the males. And this acts like a sign stimulus. So, whenever other males see this red colour, they immediately become aggressive. So, all these males try to get their own territories and if they fight with one another to defend their nest and hopefully, get the best female that is around. Ginny - A strong score to start with and as I say, judges will have a chance to revise their scores later, depending on how well the fish change colour. No pressure Jolle. Let's have a huge round of applause for Jolle Jolles from Cambridge University. Can any animals become invisible?